Constables Jon Gallichan and Carl Deacon, Sergeant Stuart Ford and First Class Constable Jason Skuse with the haul. Mr Cramb and his wife had spent the previous night away with friends, returning home about 10.30am on Saturday to find the kitchen window open and muddy shoe marks throughout the home. The intruder or intruders had taken a thorough approach to canvassing the Hamilton Hill home, seemingly striking gold with an antique watch, power tools, jewellery, perfume, clothes, recreation equipment allegedly snatched during the raid. ‘There was a really hollow feeling in my stomach,’ Mr Cramb said. 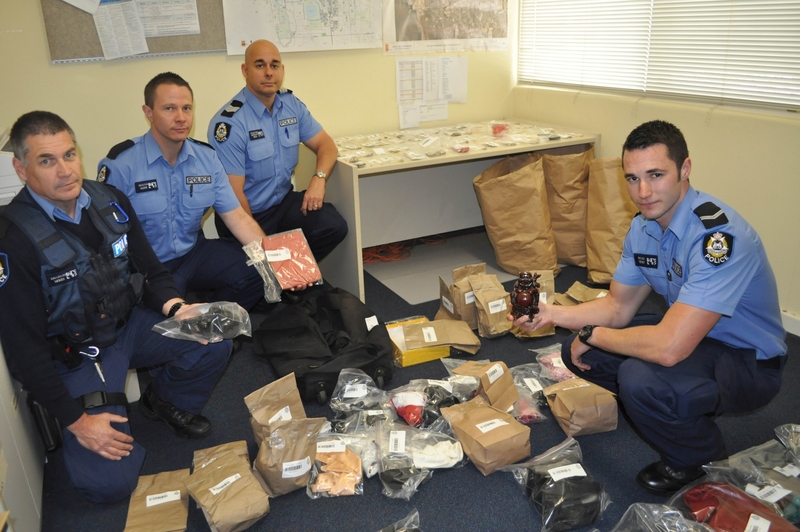 Fast forward a day and that hollow feeling had subsided somewhat with police searching a Spearwood residence on Sunday afternoon and recovering most of the stolen items. One of the key factors in the return of Mr Cramb’s items was an iPad nabbed during the burglary. Fortunately Apple’s find my iPhone feature meant Mr Cramb could use his phone to track his iPad using GPS technology. ‘It was my daughter who told me to use it,’ he said. While the technology did not give an address, it did give Mr Cramb an idea of where to look and he was soon off for a drive. ‘When I realised our things could be in the home I was in front of I basically wanted to get the SWAT team in there,’ he said. While excited, Mr Cramb knew he had to wait for police to go through their due pro-cesses. That meant passing the information on to Cockburn’s new local policing team two. ‘We can’t use GPS alone,’ LPT2 leader Sergeant Stuart Ford said. With the iPad tracking to the residence of a known thief, they were able to secure a warrant which they executed on Sunday. Police bagged 131 items and arrested two suspects. One, a 35-year-old female, has been charged over the burglary but inquiries are continuing. First Class Constable Jason Skuse said he was happy to be able to return some of the stolen items. ‘It’s the best part about it all,’ he said.